Folkmanis 2988 - Regally perched and ready to swoop comes this unmistakable symbol of majestic beauty, great strength and long life. 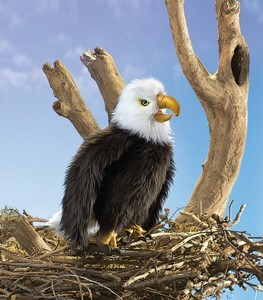 The Perched Eagle puppet is realistically rendered with keen, piercing eyes and plumage of dark brown with white head and tail. The hooked beak and powerful talons are featured in gold-hued leatherette. This puppet is a stunning representation of our national bird often prominent in seals and logos and sacred to Native American cultures. Movable head and beak. Measures 6" x 7" x 17".